Usually, I am happy and joyful person, but last year was very difficult for my country (Ukraine) and for me as well: I felt the heaviness of life and it was more and more difficult to find a reason to be happy. I was tired of my work, my family, friends, seemed that I was tired of life, everything became a routine for me. Everything was fine, but it didn’t bring me joy , so I decided that I need to go somewhere totally new to refresh my mind. I needed something totally different from my life and the activities that I used to do. 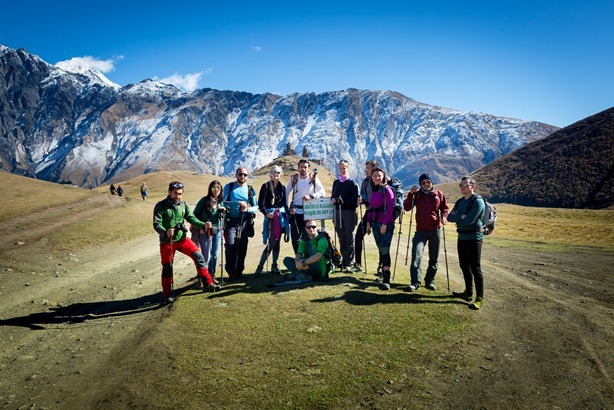 And when I saw the announcement about a team-building and leadership expedition for representatives from Black Sea Region in the Georgian mountains I realized that it is exactly that I needed. I wrote the application and when I got the answer that I’m accepted I was already jumping with joy and realized that my adventure is about to start. I was a bit scared of this trip, because I never did such a thing before (I even barely know all those equipment like crampons, ice ax or harness), but I knew that for my personal growth I need to go out of my comfort zone. And I was ready for the challenge! There is a saying of Andy Rooney, American radio and television writer : “Everyone wants to live on top of the mountain, but all the happiness and growth occurs while you’re climbing it.” It was exactly what happened with me during those days. 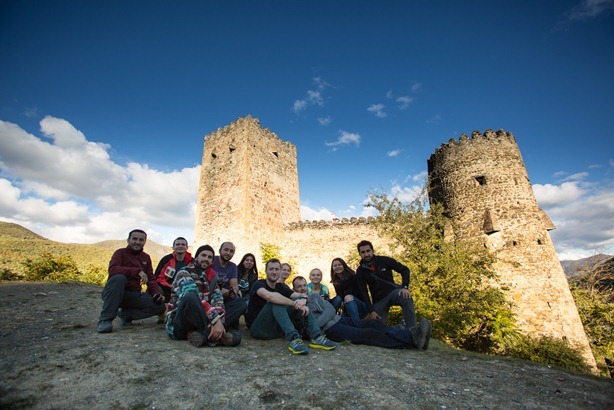 So, I met with 11 strangers in Tbilisi and we immediately started to work on the preparation for the expedition: buying local sim-cards, food, equipment, arranging transport and so on. It was a very pleasant rush, but we barely had time to talk to each other and learn something about each other. At the end of the second day I still couldn’t remember all names. But I already felt the team spirit, we were like one organism. Everybody cared about some duties that were important for the entire team. I was a chief of the cooking department and really enjoyed my duties. And I am very thankful for all who helped me in this task. I did what I do best and in the things that I had no clue about (like equipment), I totally relied on others. It was a great lesson of responsibility and trust. When we came from Tbilisi to the Stepantsminda village it was decided to take an adaptation hike to the Gergeti Trinity Church. It was a bit difficult but it was possible, so I was feeling quite optimistic about ascending to the mountain. 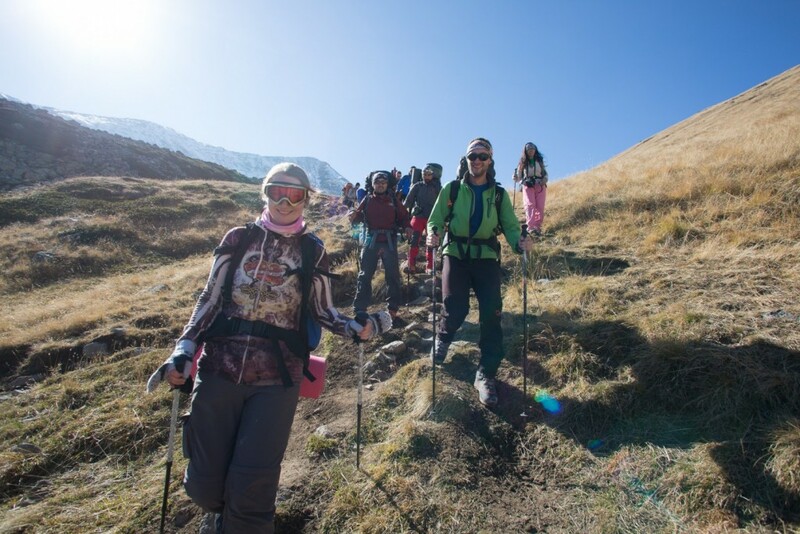 But when we started to climb the mountain next day, frankly speaking, I was thinking that it is my first and last real mountain experience and I would never do it again. It was only the beginning of the path and I really didn’t know how far we were going. So I decided just go step by step believing that each step will bring me more and more strength and I have enough internal resources to do it until the end. It just turned into meditation, I was walking, walking and walking and suddenly I realized I can do it: I found my pace, my breath synchronized with the steps and I even started to notice the beauty of the mountains. So I got a second lesson, that I’m much stronger than I think and only consistent actions will bring results. The rest of the journey was also difficult but I really started to enjoy it. There were so many touching moments of caring about each other, sharing food, socks, equipment, time, attention, everything that we had. We learned to understand each other without words, I didn’t need to ask for something, I received necessary things even before realizing that I need them. Even it was -20 sometimes at night outside, I felt so good and warm. We were 12, but not everybody was supposed to climb the summit. And the last word about that belonged to those who were the most experienced. As for me, I really didn’t know anymore what I would be able to do. And I didn’t even know what I preferred: to go or stay as a support team. Of course, getting to the summit sounded very exiting, but it demanded more efforts from me and I didn’t know if I had enough power to do it. So I decided to totally rely on the core team and their recommendation to not go there. So I just accepted everything as it was. But very interesting things happens in the night, when I was making early breakfast (3 am) and tea (ginger tea) for the summit team. I didn’t feel sad or disappointed as I probably should have, I was so excited like I was going there. And I was so happy to see our guys when finally they came back, I really felt like I did. I knew that they felt that they had reach a summit for us also. We were one and I feel that we still are, even though we have a Black Sea and 1000 km between us. When I came back everybody was interested if I climbed the summit. This is what I told them: de jure I didn’t, I didn’t get to the top of Kazbegi mountain, but de facto, I really did, I did climb my personal summit. The summit of fear and inner limitations and I found there a real treasure: inner strength, love, joy and happiness. I feel so alive now and ready for a new challenges! Nadiya Pashkova (35) was one if the participants in the Black Sea Network Project. After graduating a master’s course in business administration, Nadiya became involved with the DRO “Committee of voters of Ukraine”, where she currently works as program director and international relations coordinator. She believes that being part of the project will help her broaden her boundaries, refresh her mind, get new ideas for her personal life and work, real friends and partners and one of the most important things that she currently lacks: the ability to dream.